"Atlas Shrugged" ~ long overdue read on my part, still valid 60-70 years later. Have you read Alan Furst's books? He has reinvented the espionage genre since Ambler. The Kingdom of Shadows is a good introduction to him. Agree, the recent California dam breaking reminded me of the train in the tunnel scene and political point. Like Ambler, whom he resembles in bringing pre-war and early war atmosphere to live, Furst has his good books (like 'KoS') and lesser ones. Like Ambler, Furst's plots often remains vague. The moment Furst does insert a strong plot, like the attempt to stop othe Danbue shipping of German oil in 'Blood of Victory', the whole books benefits immensely. 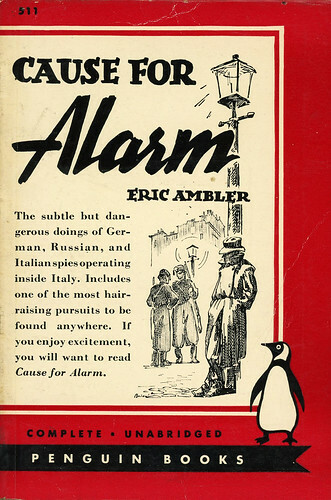 In Ambler's 'Cause for Alarm' the plot is practically absent IIRC. Last edited by Colonel Sennef; 28 Feb 17, 06:53. Really fascinating views on the KJBible and Anglican Church evolvement. Plenty of references to folks getting burnt up too. Furst is somewhat like Raymond Chandler's in his focus on atmosphere and characters while the plot suffers from just situational encounters. Last edited by R.N. Armstrong; 01 Mar 17, 07:46. "... the things they remembered, that haunted them, were not for example that a man got killed, but that in the moment of his death he was trying to pick a paper clip up off the polished surface of a desk, and it kept slipping away from him, so that there was a look of strain on his face and his mouth was half open in a kind of tormented grin, and the last thing in the world he thought about was death. He didn't even hear death knock on the door. That damn little paper clip kept slipping away from his fingers and he just wouldn't push it to the edge of the desk and catch it as it fell. What did you think of his illustration? His plots are generally weak, and when a character was no longer useful he kills them off, usually with a gun in someone's hand. Or sometimes he just kills them off and nobody - least of all Chandler knows who did it or why, as happens in The Big Sleep. There is a book of short stories by Maclaren-Ross called the funny bone. Maclaren-Ross was a somewhat bohemian author of Scots - Indian -Cuban extraction who himself appears in fictional form as the novelist X. Trapnel in Anthony Powell's A Dance to the Music of Time and as Prince Yakimov in Olivia Manning's The Balkan Trilogy. In the Funny bone there are a number of parodies of well known authors including Chandler. Maclaren-Ross always claimed that he had persuaded the authors who he knew to write self parodies and although they denied it their style is got off to a T. Marlow tracks down a shadowy figure through an overcomplicated plot. This turns out to be Chandler himself who shoots Marlow dead because he can't think of an ending that works. Great anecdote!! Thanks for sharing. The Discovery & Conquest of the New World by Irving/ W.W. Robertson Library of Congress 1892 Washington, DC. Yes, the idea of too many politicians that because they say it is so, or order it to be done, it can and should. More modern version is: "If we can put a man on the Moon, we should be able to ...."